In March of 1940, as a result of Hitler’s plans to eradicate Jews, 10-year-old Lizzi left Vienna by joining a small transport of children seeking refuge in America. Two weeks later she began her new life in San Francisco, getting a new name, Phyllis, and having to learn a new language. Her family is scattered on three continents, but linked by letters. 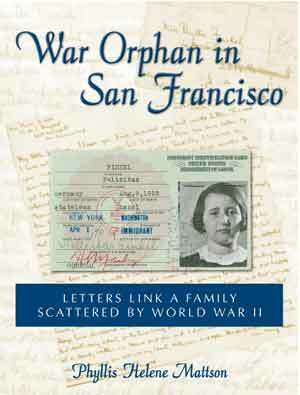 Phyllis Mattson's memoir, War Orphan in San Francisco, is a coming of age story told through family letters. Phyllis wrote her parents details of her new life as she grew into adolescence and became an American, while they tried to parent her long-distance. During the next six years Phyllis moved in and out of foster homes and an orphanage due to her rebellious behavior, but as she defended herself stoutly in her letters, she gained self-confidence and skills to become an independent, responsible adult. Her parents tried desperately to join her, but were stopped by incredible red tape and war hysteria. Her mother’s letters are unbearably painful, but despite her hard labors in German slave camps, she doesn’t give up hope. Her father’s letters show his resignation to the bureaucracy that has him erroneously incarcerated in Australia. The moods, hope, fears, and accomplishments are all recounted in the details of the letters, thereby authenticating one family’s experiences during World War II, and the love that sustained hopes of a reunion. Interwoven between the letters is a narrative that depicts the times and places of that era. Phyllis Helene Mattson was a community college teacher of Anthropology and Health Sciences in Silicon Valley. She graduated from the University of California, Berkeley, received graduate degrees in Anthropology from the University of Wisconsin and Public Health from Harvard. Phyllis started her career in health research, culminating in the book, Holistic Health in Perspective, in 1981, then turned to teaching. In 1989-90 she taught English at Shandong University in China, and in 1994 joined the Peace Corps in Nepal. She has two children and two grandchildren. "Sent across the ocean by their parents and taken in by foster parents and distant relatives, approximately 1,000 children, ranging in age from fourteen months to sixteen years, landed in the United States and out of Hitler's reach between 1934 and 1945. War Orphan of San Francisco is available on Amazon.com.